The chooks have been doing a great job of digging over my garden in preparation for my spring planting. They haven’t touched my raised beds except for all the silverbeet (there is no silverbeet to be seen anywhere!) so I’ve wanted to make a chicken tractor for ages to put the girls to work. A chicken tractor is basically a mobile chicken run. 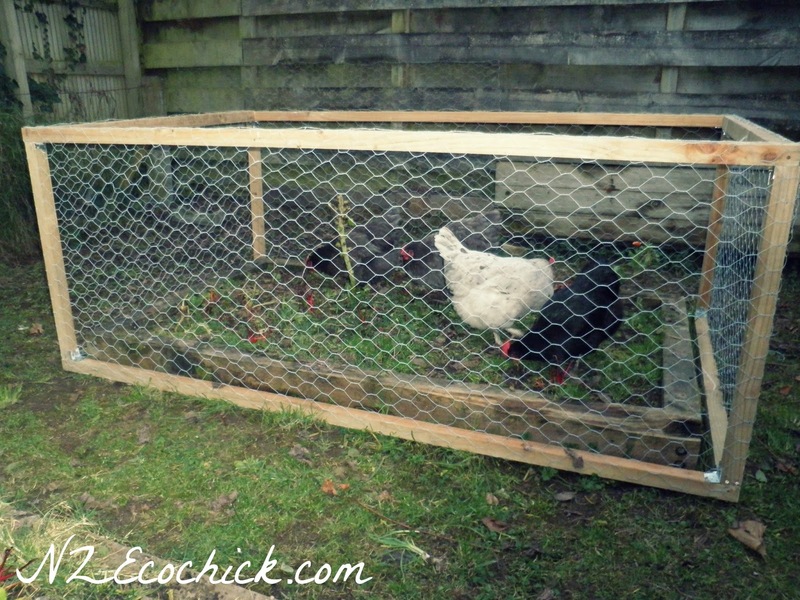 So we made a wooden frame to go over the raised beds to keep the chickens in for now and out when I plant my spring garden. This tractor was built to go over our raised beds so you could make them any size you like. We reused some wood my brother had leftover from a project plus screws and brackets we had leftover from the bathroom. Reusing these products saved us a lot of money as we think if you bought everything new this tractor would cost around $100 since wood is so expensive. Mr Ecochick cut all the wood to length. Love a man with power tools he he. 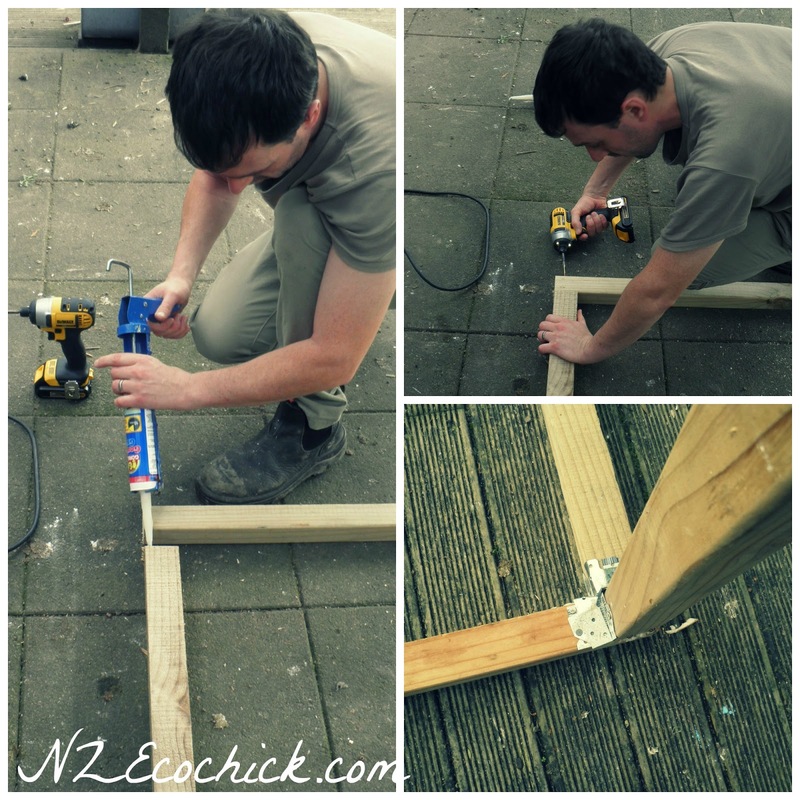 To attach all the wood together into a wooden rectangle Mr Ecochick glued the pieces, used end screws plus used brackets to keep the tractor together. First we joined the bottom rectangle all together then added the uprights. The top rectangle was joined together then we attached the top rectangle to the uprights. Once the glue was dry Mr Ecochick attached the chicken wire with staples. We ran out of wire to do the top so have just used some left over bits of plywood and a large sign that I found outside our house after some strong winds a few weeks back for now until I get some more wire for the top. My girls hard at work in their new playpen. They will weed, dig over and fertilise the soil for summer produce. Go girls go. Chickens are even better when they are laying and working as mini well… tractors. The bottom of my tractor has no wire in which is the whole point of a tractor. So that the girls can eat, dig and fertilise my garden for me. When they have finished this raised bed we’ll move them onto the next raised bed until all three have been completely dug over and are ready for planting. The tractor will then be put onto another section of the garden to be dug over. Once the garden is completely dug over the tractor will be place over one raised bed to protect my silverbeet, beetroot and spinach from the girls as they do love them so. Make sure you add some water and food for the chooks too. I’ll only be using this run during the day as the girls go back in their chicken house at night. Do you use a tractor too? Looks good. We’ve got our tractor on the garden at the moment and the girls are hard at work-or they will when they get out of bed. Great post. This is new to me and I love the fact that you are using chicken to help make a better soil for planting. That is good to know. Great instructions–looks like anyone could attempt this and succeed.